The Depew and Tonawanda Railroad, a subsidiary of the Lehigh Valley Railway, was incorporated to construct a line north from the Lehigh Valley's main line at Niagara Junction in Depew, to connect with the New York Central's "Peanut Line" near Ellicott Creek at a location to be identified as Tonawanda Junction. The line was double tracked and allowed Niagara Falls bound passenger and freight trains to bypass the railway congestion in Buffalo. From Tonawanda Junction, the Lehigh Valley utilized New York Central trackage rights to continue to their own station and their yard at Suspension Bridge. The chief through freight commodity shipped over this line was anthracite coal mined in the mountains of northeastern Pennsylvania. The shipment of anthracite to New York Harbor (actually the North or Hudson River) and to the Great Lakes and Canada was the principal reason for the building of the Lehigh Valley Railroad, most of which is now gone except for short line trackage in Central New York and Northeastern Pennsylvania. In the 1890's, Williamsville was a major industrial center for the Buffalo area, with eleven mills strategically located along the Creek, some using the water power from the falls in Williamsville. Of these, only the mill in the Village, now owned by the Village of Williamsville, remains. Remnants of another mill in the form of an old red barn, that had each year exported thousands of bags of flour to New York City via the Lehigh Valley, burned down a year ago. 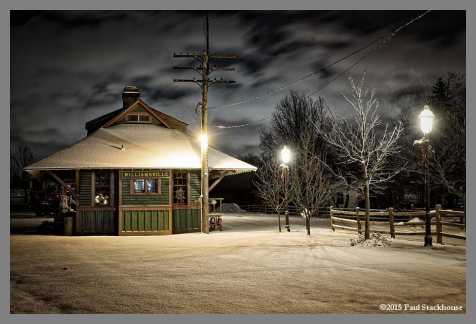 The depot in Williamsville was constructed in 1896 and was the only station on the Lehigh line between Depew to Niagara Falls. 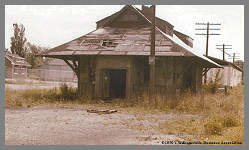 There was a three track yard behind the depot, which was manned 365 days a year, serving both passengers and freight. In the late 1890's, Williamsville was a half day's horseback ride from Buffalo, and an even longer ride by stage coach over rutted paths, as there were no smoothly paved roads. Trolley service between the Village of Williamsville and Buffalo appeared some time later. Hence passenger service was important to both the area and to the railroad. 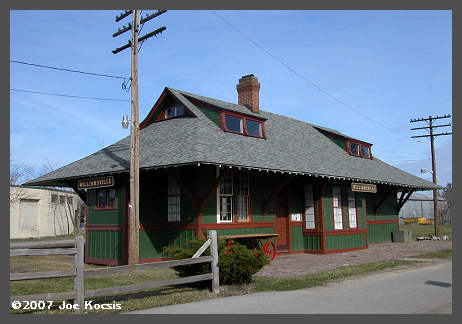 At the height of service, one could board a train at the depot to transfer in Depew for Buffalo or points east or west, or continue on to New York City. After the Pennsylvania Railroad opened the tunnels under the Hudson River, one could ride directly into the city rather than to disembark in Jersey City for a ferry trip to Manhattan. The Lehigh Valley was the only railroad coming from the west (New Jersey, Pennsylvania, Ohio) allowed by the Pennsylvania to use the tunnels to the City, since the Pennsy felt that the route of the Lehigh Valley was not competitive. The depot was built in the fashion of mainline stations from Sayre, Pennsylvania to Buffalo, all constructed between 1891 and 1896, with the depot in Williamsville believed to be the last structure completed by the Lehigh Valley Railway before the railroad was absorbed by its Pennsylvania counterpart, the Lehigh Valley Railroad. Only four other depots of this design (three in New York and one in Pennsylvania) are known to be still standing. Passenger service declined with the advent of the automobile, but continued through World War II. It is reported that some troops left for transport to the East coast and overseas through the Williamsville Depot. Passenger service ended in the mid 1940's, but freight service continued into the early 1970's with the depot manned by an agent until 1974 when the tracks were pulled up. The building was sold to International Chimney for storage space by Conrail in 1986 after years of neglect. Water damage had partially collapsed a part of the passenger side of the depot . 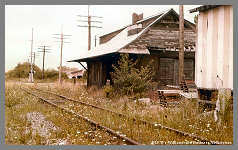 The Western New York Railway Historical Society acquired the depot from International Chimney in 1990, while at the same time, the land and a quarter mile of right of way between South Long and Cayuga streets were purchased by the Village of Williamsville for a walking and bicycle path named "The Lehigh Valley Memory Trail." Land underneath the building is leased from the Village by the Society. Paving blocks around the depot are not part of the original plan, but were originally part of a cobblestone street in the City of Buffalo, and were obtained by a member from the City for reuse at the Williamsville depot. Reconstruction of the depot initially proceeded at a less than snail's pace, until the building was re-roofed and the dormers rebuilt by volunteers after the late Ken Wiley donated the cost of the shingles. Since then, reconstruction has progressed, including the replacement of all but five windows with glass from the period, replacement of the colored class at the window peaks (following the pattern of the original glass that was found in two windows that had been boarded up inside and out). The depot crew laid the cobbles in the front of the building, which has greatly enhanced the appearance of the structure.